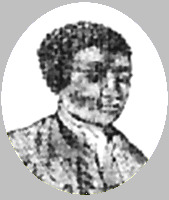 Benjamin Banneker was born on a farm near Baltimore, Maryland, in 1731. He was the son of a freed mother and a slave father. As he grew older, he showed a keen interest in building mechanical devices, even building the first wooden clock in America. Banneker developed a reputation in fields as diverse as astronomy, geology, physics, mathematics, and surveying. The latter led Thomas Jefferson to recommended him for a position on the commission to survey and plan Washington, D.C. He also published seven yearly almanacs, for which is possibly best known.